For use with the TU-15 Kastar diesel compression tester. 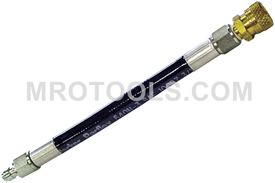 Kastar Diesel Compression Tester 7'' Extension is a 7-inch extension that helps clear the valve train, and gives that extra reach for difficult engine compartments. Dimensions: 10.625'' X 3.25'' X 2.188''. Kastar Diesel Adapter M10-1.00 Glow Plug. Adapter for Ford, Ford/Navistar 6.9L, 7.3L; GM 4.3L, 5.7L V8, Mercedes Benz E320 CDI, Navistar/International 6.9L, 7.3L, Nissan Sentra 1.7L, Various VW, Westerbeke Marine. Kastar Diesel Adapter M10-1.00 Glow Plug. Adapter for Dodge, Cummins 2.7L, GM 6.2L,6.5L V8 true diesel, Hummer H1 Optimizer 6500 and 6.2L V8, Jeep Liberty 2.8L, Mitsubishi 2.7L. Kastar Diesel Adapter M10-1.25 Glow Plug. Chevette/Izusu 1.8L, 2.2L, GM DuraMax 6.6L Turbo Diesel, Isuzu HE1-TC, 6HK1-TC, 1.8L Toyota. Kastar Diesel Adapter M24-2.00 Injector. Adapter for early Audi models, 1966-1987 Mercedes-Benz models, early Volvo Models, VW Rabbit. Kastar Diesel Adapter M12-1.25, M18-1.50 Glow Plug. Isuzu/Isuzu Truck 4HE1-TC, 6HK1-TC, Mercedes-Benz 1960-1999 models, various VW models. Kastar Diesel Adapter - 1'' Injector. Use with Diesel Compression Tester TU-15. Cummins NH, V6, V8, V12, All 5 1/2'' Bore NH, and 903 V8 Cylinder PTB. Kastar Diesel Adapter - 7/8'' Injector. Use with Diesel Compression Tester TU-15. Adapter for Cummins V-185, V-210, V-225, V-555, VT-255, VT-555. Kastar Diesel Adapter M10-1.25 Glow Plug. Caterpillar, Ford/Mazda, Ford/Mitsubishi, Isuzu/Isuzu Truck, Kubota, Kawasaki, Mazda, Mitsubishi, Mitsubishi-Fuso, Nissan, Nissan/UD Truck, Perkins, Toyota, UD Truck, Westerbeke. Kastar Diesel Adapter - M21 Injector. Adapter for Allis Chalmers, BedFord, Fiat Allis, Ford, International Harvestar, J.I. Case, John Deere, Mack Truck, Massey Ferguson, Mitsubishi-Fuso, Onan, Perkins, Scania, Waukesha, Westerbeke. Kastar Diesel Adapter - Motometer. Use with Diesel Compression Tester TU-15. Enables owner of TU-15 tester to use adapters made by Motometer. Kastar Diesel Adapter Snap-On/Otc. Use with Diesel Compression Tester TU-15. Enables owner of Snap-on and OTC testers to use TU-15 series adapters. Kastar Diesel Adapter M24-1.50 Injector. Use with Diesel Compression Tester TU-15. Cummins B Series 2.9L, 3.9L, 5.9L, Dodge/Cummins 1989-1998 5.9L; J.I. Case 2.9L, 3.9L, 5.9L. Kastar Diesel Adapter M17 Injector. Use with Diesel Compression Tester TU-15. Adapter for Cummins C series, some Deutz models, J.I. Case 8.3L, Volvo Penta MD marine engines, Yanmar. Kastar Diesel Adapter M17 Injector. Adapter for Cummins B series 3.3L; GM Duramax ID415; Hatz, Navistar/International (up to 1997) DT 360, DT408, DT466, 312, 360, 414, 436, 446 C.I.D. Kastar Diesel Adapter - 3/8'' Injector. Adapter for Caterpillar 3208, 110; J.I. Case 70 Series 188, 207; John Deere Early 300, 400, 500 Series, 276, 404, and 531 CID. Kastar Diesel Adapter - 9/16'' Injector. Use with Diesel Compression Tester TU-15. Caterpillar D336, 1674, 1676, 3406, 3408, 3412 3406B. Kastar Diesel Adapter M10-1.00 Glow Plug- Ford/Navistar. Adapter for Ford/Navistar 1994-2004 7.3L Turbo, Direct Injection Power Stroke; Navistar/International 7.3L T444E. Kastar Diesel Adapter M12-1.25 Glow Plug.Adapter for Audi, BMW, Deutz, GMC Truck, Hino, Isuzu/Isuzu Truck, Lincoln, Mercedes-Benz, Nissan, Volvo, VW. Kastar Diesel Compression Test Adapter M14-1.25. Adapter for Ford/Navistar (2003-08) 6.0L, 6.4L Power Stroke; International Harvester VT365, 4200; Navistar/International 6.0L VT365E. Kastar Diesel Compression Test Adapter, International Dt466, Dt530. Detroit Diesel Series 40; International Harvester DT466, DT530, HT530, 3200, 3800, 4300, 4400, 5500, 5600, 7300, 7400, 7500, 8500; Navistar/International 7.6L DT466E, 8.7E DT530E. Kastar Diesel Compression Test Adapter Cummins ISB. Use with Diesel Compression Tester TU-15. Adapter for Cummins ISB; Dodge/ Cummins 1998-2009 5.9L ISB. Kastar Diesel Compression Test Adapter Cummins ISC. Use with Diesel Compression Tester TU-15. Adapter for Cummins ISC and ISL. Kastar Diesel Compression Test Adapter Cummins N14. Adapter for Cummins N14. Kastar Diesel Compression Tester 7'' Extension. Use with Diesel Compression Tester TU-15. 7-inch extension helps clear the valve train, and gives that extra reach for difficult engine compartments. Dimensions: 10.625'' X 3.25'' X 2.188''. Kastar Diesel Compression Test 90 Degree Adapter. Use with Diesel Compression Tester TU-15. Straight through adapter with male and female quick couplers on each end of a 90-degree elbow. Kastar Diesel Compression Test 45 Degree Adapter. Use with Diesel Compression Tester TU-15. Straight through adapter with male and female quick couplers on each end of a 45-degree elbow. Kastar Diesel Compression Test Adapter Detroit Diesel 50 and 60. Adapter for Detroit Diesel Series 60 and 50. The TU-15-30 Kastar Diesel Compression Tester 7'' Extension is one of thousands of quality tooling products available from MRO Tools. Please browse Kastar Diesel Compression Testing Adapters for tools similar to the TU-15-30 Kastar Diesel Compression Tester 7'' Extension. TU-15-30 Kastar Diesel Compression Tester 7'' Extension description summary: Kastar Diesel Compression Tester 7'' Extension. Use with Diesel Compression Tester TU-15. 7-inch extension helps clear the valve train, and gives that extra reach for difficult engine compartments. Dimensions: 10.625'' X 3.25'' X 2.188''. Quantity discounts may be available for the TU-15-30 Kastar Diesel Compression Tester 7'' Extension. Please contact MRO Tools for details.